This is why football is a beautiful game, good sportsmanship is one of the lovely sides of sports. During Uruguay vs Portugal match, World footballer of the year, Cristiano Ronaldo was seen helping Edinson Cavani. 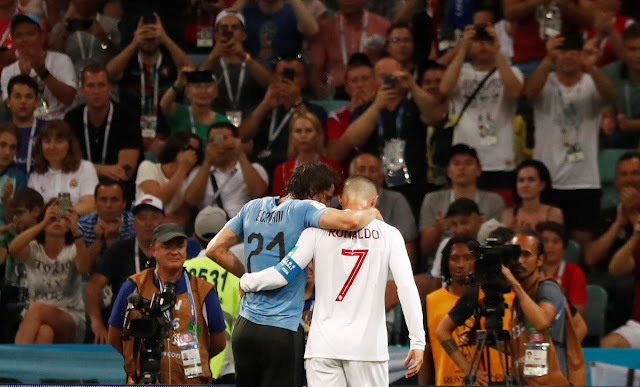 Portugal was chasing the game after going 2-1 down to two goals from Edinson Cavani, despite the importance of the match, Ronaldo first instinct was not "maybe he is faking it to waste time or some antics". The Real Madrid star helped the PSG striker off the pitch with his arm around his shoulder. Oh well, fans reacted to this gesture differently, some think it is beautiful while some think Ronaldo is trying to score points. Whichever way, it is good sportsmanship on live TV. Ronaldo helping Cavani off. If he's going to lose, he may as well get some nice guy points while he's at it. Yet another PR stunt by Ronaldo! Helping Cavani off the pitch an attempt to gain the headlines! I'll tell you right now, he didn't actually mean to help him! Damn. Such a shame to see Cavani go off when he was on a hat trick. Nice sportsmanship from Ronaldo helping him off the field. Love to see that.